Colorado Springs a Mecca for Evangelical Christians Evangelical Christians are considered an important part of the coalition that re-elected President Bush. For a two-part report, NPR's Jeff Brady visits Colorado Springs, Colo., a center for evangelical Christian organizations. When President Bush takes the oath of office this week, one group of Americans will take special pride in knowing he'll lead the country for another four years. Evangelical Christians are considered an important part of the coalition that re-elected him. For a two-part report, NPR's Jeff Brady visits Colorado Springs, Colo., which for the past decade has been recognized as a center for evangelical Christian organizations. 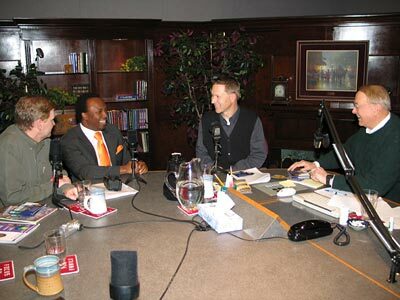 From left, Pastors Ted Haggard and Sunday Adelaja, John Fuller and James Dobson participate in a December radio broadcast. Not long ago, Colorado Springs was a fairly small typical Western town with a mix of military people, blue-collar workers and a few colorful characters looking to escape city life. But today, it's a booming city that's home to more than 100 evangelical Christian organizations. The city has become a special place for evangelical Christians, like Ted Haggard, pastor of the 11,000-member New Life Church and president of the National Association of Evangelicals. Haggard came to Colorado Springs in 1984, and found what he calls a pastor's graveyard. Only 10 percent of the people went to church and, what he says were pagan-style religions had a good-sized following. "The mega suburban churches weren't here at all, and there was a high percentage of New Age and satanic type of activity," Haggard says. Colorado Springs was ripe for a spiritual transformation, he says. Dozens of other pastors came to the city, and many succeed in opening churches. Haggard's grew from 20 people meeting in his basement to a sprawling campus on the outskirts of the city. Today, his church is one of the largest in the state. Colorado Springs also was becoming home to an increasing number of religious organizations, groups with a religious purpose that aren't churches. 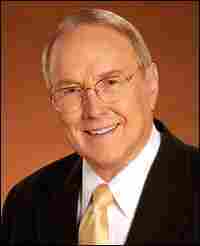 The largest such group is Focus on the Family, headed by James Dobson. His multimedia ministry includes radio, television, film and video, magazines and books. Dobson's ministry centers on his, now daily, radio program, where he gives advice on family issues -- and more recently on politics. In a broadcast shortly after the November election, Dobson expressed how grateful he was that Mr. Bush was re-elected and he criticized Democrats and the media. But Dobson also issued a pointed warning to the Republican Party. "If they get disinterested in the values of the people who put them in office as they have done in the past, if that happens again, I believe the Republican Party will pay an enormous price in four years and maybe two," Dobson said. Evangelical leaders promise that in coming years they'll be even more active in politics. And Colorado Springs will continue to be a base from which the evangelical movement launches initiatives that affect civic life across the nation.